The land of Kilforth is a perilous domain filled with nefarious monsters, mysterious strangers and treacherous locations. Throughout the land, various factions vie for power – the supposedly noble Order of the Rose, the terrifying Doom Guard, and the evil Overlord Masklaw to name a few. At the heart of Kilforth is the Sprawl, a huge city where intrepid heroes begin their journey to fame and fortune. Over the coming month, a deadly 'gloom' will descend upon Kilforth, through which the heroes must battle to prove their worth, defeat a primordial evil, and save the land from darkness. 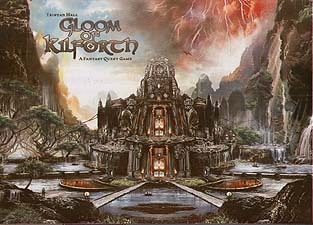 Gloom of Kilforth is a game of high fantasy with a gothic edge, where 1-4 players, working individually or together, assume the roles of heroes on a journey through a dark world of magic and peril. They will visit strange places, stranger people and defeat powerful enemies in their mission to discover mysterious artefacts and mystical spells. Each player follows their hero's tale, an epic saga from modest beginnings through to a climactic battle that will decide the fate of the world.